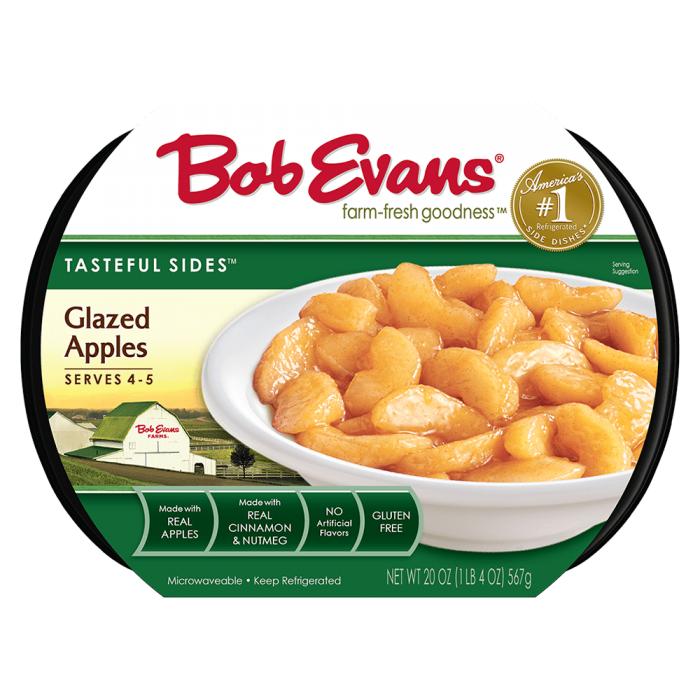 A sweet night cap, this recipe featuring our Glazed Apples, is a dessert that is easy to make and simple to serve. Preheat oven to 350ºF. Line a 9x13 baking dish with foil, leaving a 2 –inch overhang on two sides; lightly coat with cooking spray and set aside. Whisk the flour, salt, and baking powder in a small bowl. Melt the butter in a medium saucepan over medium heat and cook, stirring the butter occasionally, until it starts browning. Remove from heat and whisk in the brown sugar and vanilla until dissolved, let cool slightly. Add the eggs and whisk until smooth. Stir in the flour mixture, followed by the Glazed Apples and butterscotch chips. Continue to stir until fully incorporated into a thick batter. 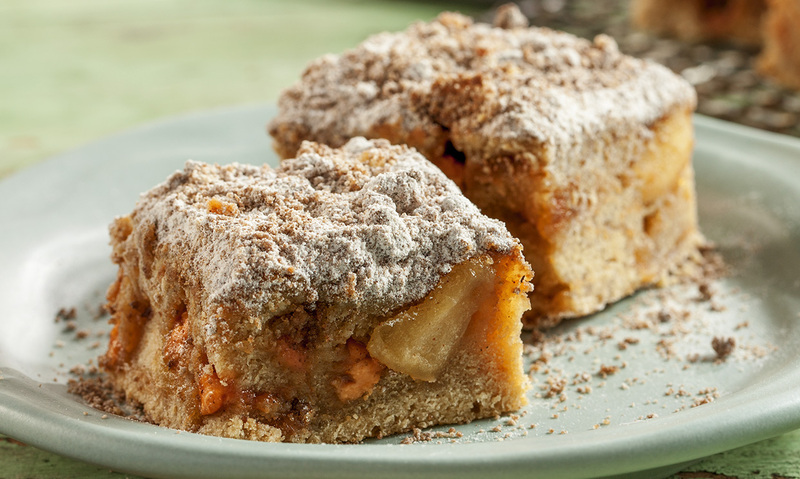 Prepare the streusel by combining all ingredients into a bowl and crumble using pressing motion with a fork. Streusel crumbles should be no larger than the size of a pea. Evenly sprinkle the streusel over the top of the batter and cover with foil. Bake the batter for 30 minutes with the foil covering the top of the batter. Remove foil cover and bake until the batter is completely set and the top is lightly browned, about 20-30 minutes. Allow to completely cool at room temperature in the pan, about 30 min. Once cooled, lift out of the pan using the foil overhang, remove foil and place onto cutting surface. Cut into 2” x 2” bars. Sprinkle with powdered sugar over top (optional). 1 Preheat oven to 350ºF. Line a 9x13 baking dish with foil, leaving a 2 –inch overhang on two sides; lightly coat with cooking spray and set aside. 2 Whisk the flour, salt, and baking powder in a small bowl. 3 Melt the butter in a medium saucepan over medium heat and cook, stirring the butter occasionally, until it starts browning. 4 Remove from heat and whisk in the brown sugar and vanilla until dissolved, let cool slightly. 5 Add the eggs and whisk until smooth. Stir in the flour mixture, followed by the Glazed Apples and butterscotch chips. Continue to stir until fully incorporated into a thick batter. 6 Pour the batter into the prepared pan and smooth the top with a spatula. 7 Prepare the streusel by combining all ingredients into a bowl and crumble using pressing motion with a fork. Streusel crumbles should be no larger than the size of a pea. 8 Evenly sprinkle the streusel over the top of the batter and cover with foil. 9 Bake the batter for 30 minutes with the foil covering the top of the batter. 10 Remove foil cover and bake until the batter is completely set and the top is lightly browned, about 20-30 minutes. Allow to completely cool at room temperature in the pan, about 30 min. 11 Once cooled, lift out of the pan using the foil overhang, remove foil and place onto cutting surface. Cut into 2” x 2” bars. Sprinkle with powdered sugar over top (optional).